Bae, HS, (2006), Body mass index, dietary intake, serum lipids and antioxidant status of young females, Korean J Community Nutr, 11(4), p479-487. Choi, JH, Han, HJ, Hwang, JH, Chung, SR, Moon, HM, Park, MI, Cha, SR, Oh, JE, Park, YS, (2006), Metaanalysis of clinical studies of pregnancy and delivery in elderly gravida, Obstet Gynecol Sci, 49(2), p293-308. Englund-Ögge, L, Brantsæter, AL, Sengpiel, V, Haugen, M, Birgisdottir, BE, Myhre, R, Jacobsson, B, (2014), Maternal dietary patterns and preterm delivery: Results from large prospective cohort study, Bmj, 348, pg1446. Farhud, , Dariush, D, (2015), Impact of lifestyle on health, Iran J Public Health, 44, p1442. 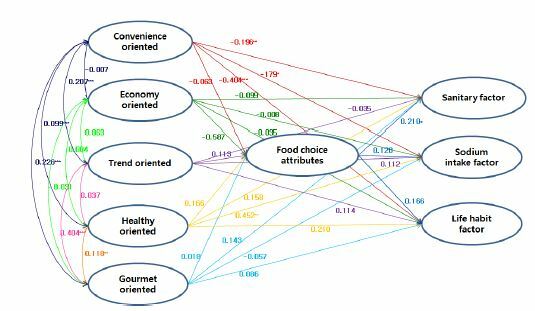 Han, MH, (2014), A survey on needed processed food development according to consumers with different attributes, MS Thesis Sookmyung Women’s University, Seoul, p61-63. Ibrahim, M, Forsyth, S, (2002), Nutritional interactions between mother and fetus, Pract Midwife, 5(10), p10-17. Jang, YA, Lee, HS, Kim, BH, Lee, YL, Lee, HJ, Moon, JJ, Kim, C, (2008), Revised dietary guidelines for Koreans, Asia Pac J Clin Nutr, 17(S1), p55-58. Kim, KH, (2005), Dietary behavior and related factors of pregnant women, MS Thesis, Yeungnam University, Daegu, p46-49. Kwon, OY, (2015), A study on awareness and purchase behavior of food for special dietary uses: With priority given to food for pregnant and lactating women, MS Thesis Konkuk University, Seoul, p67-69. Lee, EB, (2013), Pregnant woman's awareness and knowledge regarding risk factors for food and its influence on purchasing behavior, MS Thesis Kyungpook National University, Daegu, p48-49. Lee, SH, Kim, ID, Baek, JY, Kim, YJ, Joo, SH, Cho, SJ, (2006), A clinical and statistical study of pregnancy and delivery in the mid-teenager mothers, Obstet Gynecol Sci, 49(12), p2520-2528. Lee, SL, (2005), A study of dietary habits and health related factors that affected in pregnancy outcome, MS Thesis Hanyang University, Seoul, p124-126. Ministry of Health & Welfare, (2010), Dietary guidelines for Korean with action guides, http://www.fao.org (accessed on 10. 9. 2010). National Health and Medical Research Council, (2010), https://www.nhmrc.gov.au (accessed on 10. 9. 2010). United States Department of Agriculture, (2010), Dietary Guidelines for Americans 2010 (7th ed. ), Washington, DC: US Government Printing Office. Yoon, SY, (2009), A study of nutritional knowledge and dietary habit of pregnant women in Jeonju area, MS Thesis Wonkwang University, Iksan, p5-6.